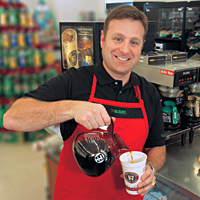 International retail chain 7-Eleven has built its image on convenience and service. So it makes sense that the company's president and CEO, Joe DePinto '99 (EMP-42), encourages "servant leadership" among employees. He says this management style is based on the premise that to lead, one must serve. "It's an approach that relies on personal influence versus power, one that requires leaders to coach and work alongside others to build credibility," says DePinto, who brought this perspective with him when he returned two years ago to 7-Eleven. DePinto was head of the firm's operations from 2003 to 2005, but for about 8 months between his former and current role at 7-Eleven, he was president of videogame retailer GameStop. "I left what I thought was a great opportunity (at GameStop) for a job that was really difficult to pass up," he says. Prior to DePinto's tenure as CEO, the company was centrally controlled. "When I came back, I wanted to make sure that we set up the organization to develop leaders at all levels and that decision making was being done across the board." That meant communicating 7-Eleven's strategy clearly. "When the strategy is in place and folks understand it, decisions become very easy." DePinto and his colleagues implemented these ideas and established metrics to evaluate progress — including performance reviews that assess business results and servant leadership. With more than 33,000 "small-box" stores worldwide, DePinto says a significant part of 7-Eleven's strategy is retailer initiative, or a localized product assortment. Shelf space is allocated according to how well a product sells in that market, and if it is slow to sell, it is cut back or replaced. "Each week our merchandising department identifies 30 to 40 new items that we believe are high potential." This method requires a robust pipeline of new items, he says, something that being a global organization enables. "We can tap into product trends that are occurring in different parts of the world and share that information across all our business units." One example of this is green tea, traditionally popular in Japan. Once introduced in the U.S., it has performed well also. Similarly, U.S. stores, which sell about 10 percent fresh food items, will work toward the 40 percent sold in Japanese stores. "Fresh food items are in demand in the U.S. as customers are looking for convenience and trying to simplify their lives." This strategy connects with one of the valuable lessons DePinto says he learned at Kellogg: Everything starts with the customer. "This means not only putting products in the store that we know will sell, but also forecasting trends to determine products that we believe will sell in the future." An example of how the retailer recently connected with consumers was through a marketing effort tied to the release of "The Simpsons Movie." The company redesigned 12 of its stores as "Kwik-E-Marts" and brought to life fictional items like Sprinklicious doughnuts, Buzz Cola, Squishees and KrustyO's cereal. "'The Simpsons' has satirized parts of American culture, including convenience stores," he says. It was a unique opportunity to partner with the movie producers, and DePinto says customers particularly enjoyed it. This creative leadership is something he traces back to his Kellogg experience, and to his earlier military service as a West Point cadet and, later, as a member of the U.S. Army. "The military was a tremendous learning and leadership experience for me. Kellogg helped enhance that leadership and provided a solid business foundation, as well as a network of intelligent folks that I can always rely upon."